(CNN) -- Jamaican Usain Bolt continued his remarkable summer by producing another awesome performance to win the 200 meters at the Golden League meeting in Brussels on Friday. 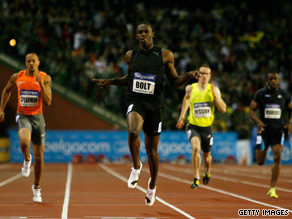 Bolt leaves his rovals a clean pair of heels with a superb victory on a rainy night in Brussels. Despite the cold and damp conditions, Bolt produced the fourth-fastest time in history, clocking 19.57 seconds to decimate the meeting record of 19.79 seconds set by Tyson Gay three years ago. The double Olympic and world champion, who opted to contest the 200m instead of the 100m in Belgium, was never threatened as he ran a perfect bend and powered down the home straight to score a 10th consecutive half lap win. The last time he suffered a 200m defeat was when he was beaten by the American pair of Wallace Spearmon and Xavier Carter at the Belgian venue two years ago. Spearmon was a distant second on this occasion in 20.19 seconds with 19-year-old Azerbaijan sprinter Ramil Guliyev third in 20.47 seconds. Bolt told reporters: "I am very tired, my body was telling me to slow down. I was fatigued in the last 20-30 meters of the race. "But the crowd gave me that extra push -- the fans always expect something extra from me and I was very surprised by the energy they gave me." With Bolt an absentee, Asafa Powell scored a thrilling 100m victory ahead of Gay -- the American who finished ahead of him at the World Championships --with an impressive time of 9.90 seconds. Gay, still nursing a groin injury was never in contention finishing in 10.00 seconds, ahead of fellow-countryman Darvis Patton (10.08). Meanwhile, as expected, American Sanya Richards, Russian Yelena Isinbiyeva and Ethiopian Kenenisa Bekele all won their events to share the $1m prize fund awarded for athletes who triumphed in all six of the Golden League meetings. Richards won the women's 400m with another awesome display, highlighted by a tremendous sprint in the final 100m. The 24-year-old American posted a world leading mark for the third time in successive races -- and her time of 48.83 seconds was also a meeting record. Isinbayeva outclassed her women's pole vault rivals for a second successive Friday, with a winning height of 4.70 meters tonight. With victory assured, the Russian had the bar raised to 5.07m -- a centimeter higher than the 15th world outdoor record she set in Zurich a week ago -- but the unfavorable conditions ruled against her. Meanwhile, Bekele toyed with his men's 5,000m rivals before speeding away at the beginning of the home straight to win in a time of 12 minutes 55.31 seconds.